Examiner in Dressmaking, Tailoring, French Pattern Modelling, Plain Needlework and Millinery, of the Teachers in Training at the University College of South Wales and Monmouthshire, Cardiff, the London Technical Examination Centre, etc. Author of " Up-to-date Dresscutting and Drafting," also" The Practical Work of Dressmaking and Tailoring." The straight line-------represents the edge of the pattern, without turnings, for the fitted garment. The broken line----------------represents the turnings - i.e., where the material is to be cut. The double broken line = = === represents the material folded over. The crosses + + + + represent the outlines of the pattern. They merely denote the correct position in which the different parts of the pattern are to be placed on the material, not where it is to be cut. 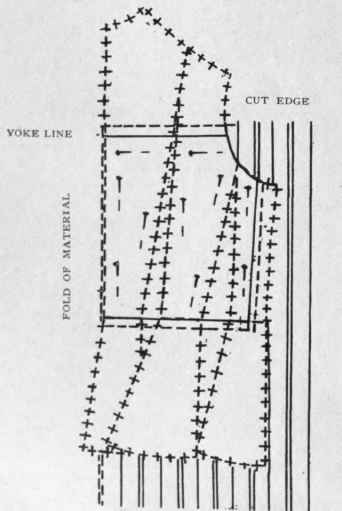 Diagram i shows the position in which the pieces of the pattern are placed on the material, which has been already pleated for the right front. Place the material right side uppermost on the table, and place the front of the bodice pattern on it, with the front line down the centre of the box-pleat. Next place the "side of front" near to, but not touching, the front piece, as shown on the diagram. N.B. - The reason these two pieces are not placed quite close together is to give a little more width across the chest, as a shirt or blouse should, of course, not fit so closely as a tight-fitting bodice. The "side piece" must next be placed near the "side front," the two edges meeting. Pin the pieces of the pattern to the material in the position shown in the diagram. To avoid puckering, it is better to use push-pins. Make a chalk mark on the material at the neck point and armhole, at each end of the slanting line denoting the edge of the yoke. From the mark on the armhole draw the curve for the armhole to half the width of the side piece; fold the side piece over to half its width, and draw a line on the material close to the folded edge, and as far as the "waist line," make a mark, and a mark on the material at the "waist line" of the "side front," and on each side of the "front." Remove the pattern, and draw a curving line by the chalk marks, and a second curving line about one inch below it. This gives the "waist line" for the shirt. With a square draw a line for the edge of the yoke by the marks at the neck and armhole. Commence the cutting, allowing turnings about half an inch beyond this line, also half an inch beyond the arm-hole, side, and waist lines. The left half of the front must next be made. This should be commenced from the opposite selvedge, so that it may "face" the right half. Turn down a hem about one and a half inches wide on the wrong side of the material, the same length as the box-pleat on the right half. Pin and then tack this hem; make the four pleats to match those on the right half; pin, tack, and then machine-stitch them and the hem. Lay this pleated material on the table and place the right half over it, the two pieces facing and the pleats exactly one over the other. Pin them carefully together, and cut out the second half. 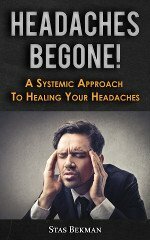 Put the fronts aside until the back has been made. To do this, measure half the width of the material and place a pin downwards near the cut edge, on the double stripe which is nearest the half. 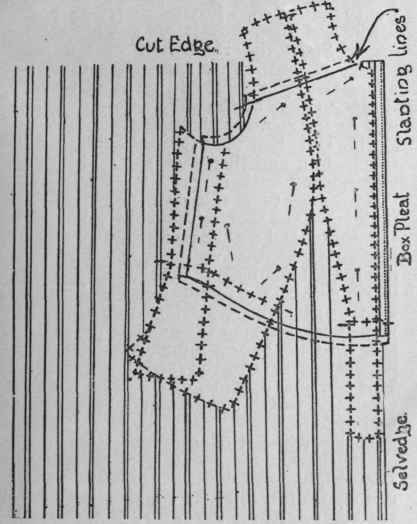 To ascertain the length for this lower portion of the back, deduct the depth of the back of the yoke, minus the turnings, from the "length of back" measurement, and mark the remaining number of inches, plus half an inch for turning at the top, across the centre back stripe for the lower portion - e.g., if the depth of the yoke is five inches, minus turnings, and the "length of back" measure is fifteen inches, the lower portion must be marked ten inches, plus half an inch for turning at the top. The fold at the edge of each pleat must be perfectly straight, but the pleats must be made deeper at the waist, so that the edge of the first on each side may slope gradually to within about half an inch of the centre-back stripe at the waist, thus forming almost a V down the back. The second pleat on each side should slope to about half an inch from the first. These four pleats require very careful fixing and tacking. They can be either machine-stitched all the way down (the same distance from the edge as the front pleats), or they can be tacked, well pressed on the wrong side, and then stitched across the top and across the waist only. Diagram 2. The "back," "side body," and "side piece" of bodice pattern placed on material already pleated- for the back of shirt. These two lines give the "depth of yoke" and the "waist line." The lower portion of the back is now ready for the yoke. Place the back of the yoke, right side uppermost, straight across the top of the pleats, the centre of the yoke at the centre-back stripe of the lower portion, and with the turned-in edge just on the chalk line. Pin and then tack it on neatly near the edge. Place the right half of the front, right side uppermost, flat on the table just under the right front of the yoke, with the turned-in edge of the yoke across the pleats just on the slanting chalk line. Pin, and then tack it on neatly near the edge. Pin, and then tack the seams of the under-arm together ready for fitting, with the turnings right side out. Remove the tacking from the pleats down the fronts, and gather each front with strong cotton along the waist line, commencing three or four inches from the underarm seam, continuing to the front edge. Draw up this gathering-thread to the size of the waist; place a pin at the end of the gathers, and twist the cotton round, over, and under it to secure it until the shirt has been fitted. This can now be done, or it can be put aside until the sleeves, collar, and basque have been made. If the fitting is done at this stage, put it on the person for whom it is being made, and pin the back down at the waist to keep it in position. Pin it evenly down the front, the box-pleat over the hem. If the shirt is too loose round the neck, the front yoke must be unpicked and a deeper turning made at the neck point of it, gradually sloped to the original one at the armhole. If the shirt is too loose across the back or the front, the under-arm seam must be unpicked and taken in, either from the back or the front, or both, if necessary. Only one side of the shirt must be fitted, preferably the right side. Take off the shirt and mark the correction to be made on the seams; and while the turn-ings are still together, make a notch in them, so that when they are undone to correct the other half of the shirt the notches may be a guide for putting the scams together again. Unpin the seams, place the two fronts evenly together, the pleats exactly over each other. Tailor tack through the corrected line to the left side, and notch the turnings to correspond. Fold the back together, and tailor tack through to the left side, and notch the turnings in the same way. To be continued.